If you need a vacuum cleaner that is easy to carry around, even when going up and down stairs, with great power then you might want to check out cordless backpack vacuum cleaners. Many people don’t even know that backpack vacuums exist, yet alone a battery powered one. You mostly see backpack vacuums being used in commercial use; I even did a little post on the wired ones here that go into more detail about this. 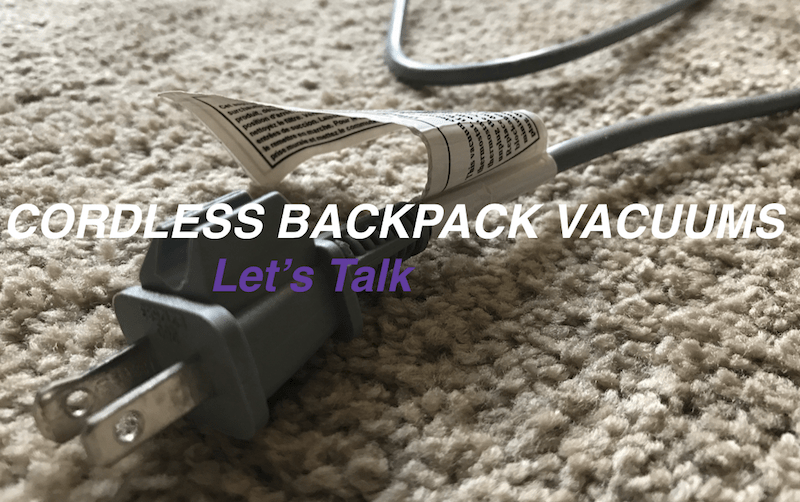 What I want to do is talk a little bit more about the cordless backpack vacuum to see if it is something you might enjoy having or need for commercial use. The cordless backpack vacuums are ideal for anyone with a large home, especially if you have stairs. There is nothing more frustrating then unplugging your vacuum to clean a new section of the home. When you’re in the mood to clean you don’t want to get out of the mood. These vacuums are also great for commercial use too. Sometimes you’ll clean a place with very few outlets or outlets that can’t handle the powered needed to run a modern-day vacuum cleaner. I even have seen these cordless vacuums being used in ECO-friendly cleaning businesses since they can charge by solar or other renewable sources where they’re kept. That’s a cool business model if you ask me. These cordless backpack vacuums are also great for people who just hate dealing with power cords. We’ll talk a little more about this below. The biggest perks have got to be the ability to clean stairs without having to worry about a heavy upright vacuum falling. The vacuum is on your back and out of the way. When it’s on your back your a cleaning machine and cleaning the entire home is quite easy. The best thing about many of these cordless backpack vacuum cleaners is that some of them have great battery life. Many cordless vacuums give other cordless vacuums a bad rap, but battery powered backpack vacuums can have plenty of run time and power. Just check the GV 8 Qt Quart Cordless Backpack Vacuum here as it has a run time of about 1 hour on a full charge. That’s impressive! Another significant aspect of a cordless backpack vacuum is that you don’t have to worry about wrapping up or storing the power cord. In the post I wrote about on the wired backpack vacuums, having the long power cord was a huge feature, but what is not so great is storing away the cord. With these cordless models, you just plug it in as you would plug in your phone and that’s it. So much easier than wrapping up a long extension cord or worrying about people tripping over the cord when I’m working. Many people use these cordless backpack models for commercial use. Sometimes you’re not near a plug, or the place you clean professionally doesn’t allow access to the plugs. Or some homes are so old that they can’t handle the power that most modern day vacuum cleaners need so they have to use cordless vacuums for cleaning. If you have an older home that can’t handle the amps that a modern day vacuum needs then this can be a great option. Yes! If you have pets or long hair, then I recommend you get a carpet rake like this one here to use with your vacuum cleaner. Carpet rakes are perfect for combing the hair and other debris trapped in the carpet. This helps your vacuum cleaner out and to me makes the carpet feel cleaner. I would not use a carpet rake on loop carpets. I like the GV 8 Qt Cordless Backpack Vacuum here. What I love about it is how light it is compared to other cordless models like it. Plus it has great battery life and is simple to use. What I like to do is have 2 batteries, one on charge and the other in the machine. So when the first battery is drained I swap it out with the one that is charged. This might not be needed for everyone as the battery life is good, but if you’re cleaning a big commercial area, then you might need to consider it. Oh yeah, almost forgot the biggest reason to look at getting the GV 8 QT as it has got to be the price. Usually, a vacuum with this much power and battery life cost a pretty penny, but GV has it priced well if you ask me. Just check out the price of the GV 8 QT Cordless Backpack Vacuum here. Or if you want to see my other post about the wired backpack vacuums then click here.